"It doesn’t matter whether you have a lot or a little—what matters is that you think about the money you have as your wealth, and that you pay attention to it. Being engaged is the only way to reach your personal goals." 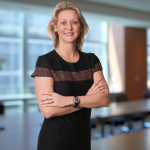 SAN FRANCISCO--(BUSINESS WIRE)--Americans are split on their definitions of wealth, according to new research from Charles Schwab, with some describing wealth as a specific sum of money and others describing it more as a state of mind. To help track how well Americans across the wealth spectrum are planning, managing and engaging with their wealth, Schwab developed the Modern Wealth Index. The Index, which is grounded in Schwab’s Investing Principles, assesses Americans across four factors: 1) goal setting and financial planning, 2) saving and investing, 3) staying on track, and 4) confidence in reaching financial goals. 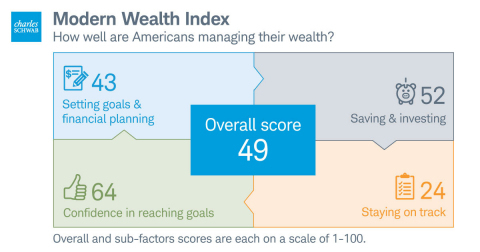 On a scale of 1-100, Americans received an average Modern Wealth Index score of 49. Among the four factors of the Index, Americans score highest when it comes to confidence in reaching their goals, while the actions it takes to stay on track—such as checking account balances and rebalancing investments—was the largest drag on the overall index score. 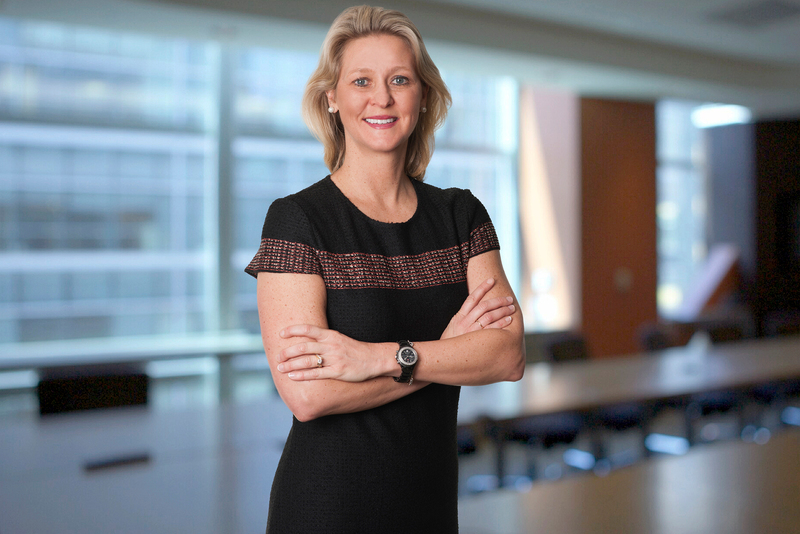 “With an average score of 49, we’re seeing people fall near the midpoint of the index, which means they’re doing some things well but there’s also some room for improvement,” said Kallsen. Overall and sub-factors scores are each on a scale of 1-100. According to the Modern Wealth Index, more than a third of millennials (34 percent) say they have a written financial plan compared to far fewer Gen X (21 percent) and boomers (18 percent). Impressively, nearly three-quarters (72%) of millennials developed their written financial plans with professional help, and 91 percent of them review or update their financial plans at least annually. Millennials also have room for improvement when it comes to debt management. Two-thirds (67%) say they don’t always make their student loans and mortgage payments on time, and nearly seven in 10 (69%) say they have credit card debt. As millennials age, their habits appear to improve, however. Among older millennials in their thirties, nearly 60 percent (57%) say their financial health is better than it was five years ago and nearly half (47 percent) say they have a household budget compared to those in their 20s (35 percent) who admit they do not. 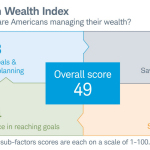 The Modern Wealth Index, developed in partnership with Koski Research and the Schwab Center for Financial Research, is based on Schwab’s Investing Principles and composed of 60 financial behaviors and attitudes – each assigned a varying amount of points depending on their importance. The Index broadly assesses Americans across four factors: 1) goal setting and financial planning, 2) saving and investing, 3) staying on track, and 4) confidence in reaching financial goals. Based on the total number of points received, respondents were indexed on a 1-100 scale for each of the four factors and an overall score. The online survey was conducted by Koski Research from April 12 to April 20, 2017, among 1,000 Americans aged 21 to 75. Quotas were set so that the sample is as demographically representative as possible. The margin of error for the total survey sample is three percentage points. 1 Smith, Adam, R. Chenevert, J. Eggleston. Improvements to Measuring Net Worth of Households: 2013. Current Population Reports P70BR-143. U.S. Census Bureau, Washington, DC. 2017.